As I mentioned last month, I have been very interested in the 1940s lately. It’s not a period that I’ve been interested in normally, but watching a rather lot of Foyle’s War has infected me, I suppose. The thing about the 1940s, which makes it a little difficult, is that in the middle of the decade there’s a rather important event known as World War II (though I tend to share the view of scholars who argue there weren’t two wars, but rather one war with a twenty year cease fire in the middle). The full skirted suit is of the style that came out of the war in 1947, thanks to Dior’s New Look. The other suit jacket and skirt are both based on the short lived fabric restrictions known as “Uility clothing” in England. In fact, these restrictions are one of the reasons vest for men fell out of fashion in the United States and England. I’m pleased about this set, though her hair isn’t quite right. I have trouble with hair and I think something about the style makes her look somewhat… angry. Irma asked: How much time in a week do you spend drawing paper dolls? I tend to work in bursts. Some weeks I do lots and lots of drawing and inking and other weeks I can go and never touch them. My goal is always to have the images, at least, ready far enough ahead that I don’t have to play catch up too much. I know there is no way I could possibly draw, ink, scan, color and post a set all in one evening. It just wouldn’t happen. I don’t have that kinda time, so I work in sections. For example, I already have the rest of this week’s paper dolls ready to post and, though I haven’t written the blogs yet, the images are prepped and uploaded to my server. I tried to keep track of how long this set took me to get ready from scan to prep, so I could at least tell Irma that much, and I found that it took me four hours from the scanning to the posting, granting that I was watching an episode of the West Wing at the time and took a few breaks. By the way, if you haven’t been to it, Irma’s blog is fantastic. 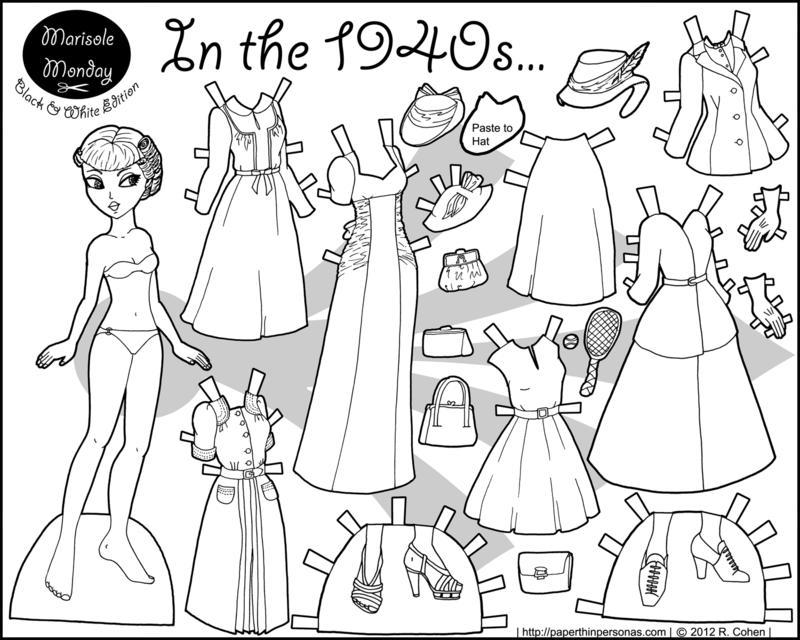 I love her black and white paper dolls. Thank you for answering my question and saying nice things about my blog. You’re welcome, Irma. It’s a wonderful blog. Marisole Monday is my favorite paper doll since I’ve been having medical problems. I’m 19 and for the past month I’ve had to drop out of college plus other numerous terrible things have happened and my mom has been keeping me busy with these and I love them. Thank you. You are right, she looks VERY angry….